Super Wheatgrass Combo is equivalent to eating a dark green leafy salad. 100% organic Wheatgrass, Barley Grass and Lemon Grass stimulates enzyme production for improved overall GI track health by scrubbing your intestinal track. 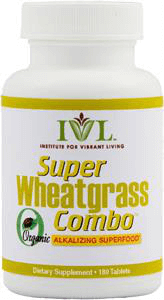 Super Wheatgrass Combo provides better nutriention to your bloodstream and may help reduce fat and inches.